In case you missed it, Clare Lise Kelly, senior architectural historian for Montgomery County, Maryland, recently published a fantastic book, Montgomery Modern: Modern Architecture in Montgomery County, Maryland, 1930-1979. The section on one of my favorite topics–prefabricated housing–starts on page 19. It includes a mention of the late-1940s plywood-panel Gunnison Homes (possibly the cutest of all the postwar prefabs, IMO). I was honored to see, in the footnotes, that Kelly used my blog post on the Gunnison Homes in Silver Spring and Kensington, Maryland as a resource for the book. From my cursory windshield surveys back in 2010, it seemed that most of the thirteen Gunnison Homes in Silver Spring possessed sufficient integrity to warrant a National Register multiple property nomination. Sometimes research topics intersect in really strange ways. There I was, knee-deep in ice house research, when I got a message from a journalist friend asking, “Jen, do you know anything about the Falls Church ‘igloo houses’?” Beyond the apparent sub-zero nomenclature, unfortunately, there is no connection whatsoever between the two types of structures. The first was usually an underground pit (at least in the early 19th century) built to store ice through the summer. The second was an igloo-shaped dome made of concrete sprayed over a giant balloon, a late 1930s invention of a California architect named Wallace Neff. At the time the igloo houses were constructed in 1941, ice houses were well on their way to obsolescence thanks to the Rural Electrification Project and the advent of electric refrigerators. But the “igloo houses” and ice houses did have one thing in common–both served as a cool retreat in the summertime. Neff’s concrete dwellings apparently stayed comfortable, albeit damply so, in the heat of our northern Virginia summers, prior to the advent of air conditioning. Alas, they were razed and replaced by an apartment complex in the early 1960s. Read more about the igloo houses, officially named Airform homes, courtesy of talented writer and historic preservation advocate Kim A. O’Connell, in the March-April 2016 issue of Arlington Magazine. The 1931 Aluminaire just can’t catch a break. It has been moved, and subsequently forgotten, not once, not twice, but thrice in its lifetime. Each time, after a brief flurry of excitement about this one-of-a-kind early American International-style house, it has faded back into obscurity, waiting to be rediscovered yet again. 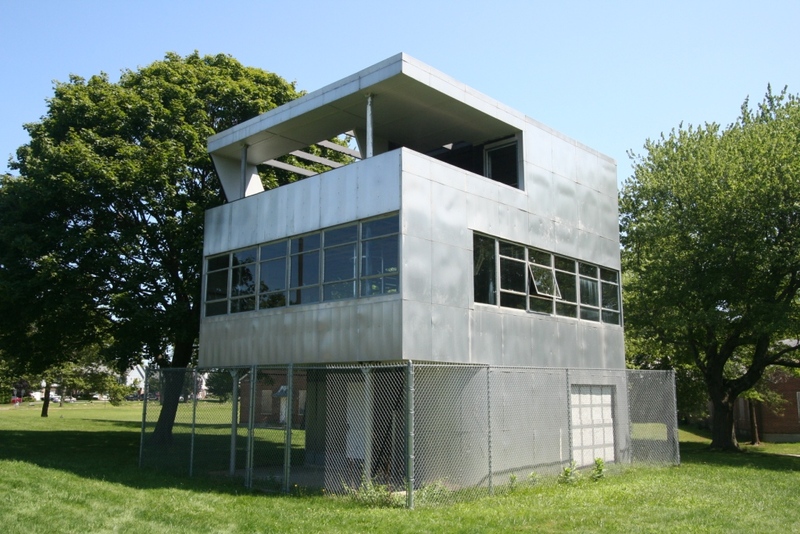 Designed by architects A. Lawrence Kocher and Albert Frey for the 1931 Architectural League exhibition in New York, the Aluminaire was one of only two houses by American architects to be included in the Museum of Modern Art’s famed 1932 International Exhibition of Modern Architecture. In the late 1980s, a grassroots campaign helped save the house from demolition, and the New York Institute of Technology got a grant to disassemble and move the house to their Central Islip, Long Island campus. Here’s a New York Times piece about the restoration project. From the ubiquitous (“George Washington slept here”) to the obscure (Bunny Man Bridge), every community has local lore unproved as fact or fiction. Local legends, like some old Hollywood screen legends, often refuse to die. Local myths linger on, taking on new life and usually growing more salacious with each successive generation. Sometimes the story is so preposterous, local historians won’t touch it. But often there’s just enough plausibility, or even a thin shred of evidence, to lure us on a wild goose chase for the truth. Ultimately, confirming or disproving the story becomes secondary to the value local lore holds in our personal and collective memories. In Arlington, Virginia, there’s a long-held story about a local visit from silent film star Pola Negri. Many Arlington residents have heard the story that Pola Negri once lived in the 1920s stone bungalow on Military Road, converted into the Gulf Branch Nature Center in the 1960s. The staff of the Nature Center have even incorporated the Pola Negri connection into their programs, screening her films during an annual “Pola Negri Night.” But despite the many affirmations of the Pola Negri connection in local news stories about the Gulf Branch Nature center, a source of documentation is rarely cited.